In a previous post, I noted that a spiritual look at the body can allow one to make connections between mystical truths and physiological truths. Inspired by Blessed Pope John Paul II’s writings on the Theology of the Body, one can consider diseases and death itself from a mystical lens. In that sense, one is offering a Theology of the Body of a different flavor than what is usually thought of when someone speaks of the Theology of the Body. As stated beforehand, this is outside of the focus of Blessed Pope John Paul’s writings normally referred to as the Theology of the Body. Those general audiences can be found collated in multiple publications in print, as well as online (here is one example of such a collection). There was no collection of reflections that Blessed Pope John Paul gave us with such an emphasis upon the problem of suffering and death, but the Great Schism (as it is often called) was described by him using terms relating to the Body. He wrote that this lack of full communion between East and West was like a body breathing with one lung. In this reflection, I would like to challenge us to consider the schism between Catholics and Orthodox from an even deeper perspective. Without calling the lung analogy inaccurate, this reflection will offer an alternative perspective that may prove more useful as one meditates upon the human body and the mystery of the Church.Of course, we should bear in mind always that analogies are always inaccurate when taken to extremes. Still, I strongly believe that the more one understands biology and the body, the more one can understand what St. Paul meant when he called the Church the mystical Body of Christ. In part 1 of this post, I noted that this physical infirmity of having one lung is more of a quantitative reduction. Let’s continue along this angle. If the schism between the ~1 billion Catholic Christians and the ~300 million Orthodox Christians is only considered as a quantitative loss, the lung analogy holds up. And of course, this is quite true. Consider the sufferings of so many Christians in places such as Egypt, and one can sense how urgent reunion is. If we were all in communion with one another, our common cause would be strengthened. May God spare His people of further suffering and use the current events for reunion! Nevertheless, I think that one must admit that there is more to the schism than just a quantitative loss. Instead, there is a further angle of the schism where one can sense that the lack of communion between Catholics and Orthodox is qualitative. The genius that each particular Church has due to its culture, liturgical tradition, favorite saints, hymnography, can never be shared so well as one could if one were in full communion with one another. And thus we have the problem that so many would say about the churches today. So, if we admit that there is a need for a qualitative description of the loss of full communion between East and West, what physical deficiencies might ‘color’ this analogy better? I would like to suggest that a better view would be to look at the eye. In the eye, there are qualitative defects which occur when one lacks particular cell types in different cases of human diseases. Here is an image of the eye’s cellular makeup from the famous textbook known as Gray’s Anatomy. Among this cellular complexity, one dichotomy arises. There are cells known as rods, and other cells right next to them known as cones. Why is this important to our Theology of the Body Broken? When one learns more about the physiology of seeing, one learns that rods are photoreceptor-containing cells which are robust in differentiating objects, particularly in low light conditions. In contrast, cones are the cells responsible for differentiating colors. In individuals (usually males) who are color blind, the most common culprit is with the cones. 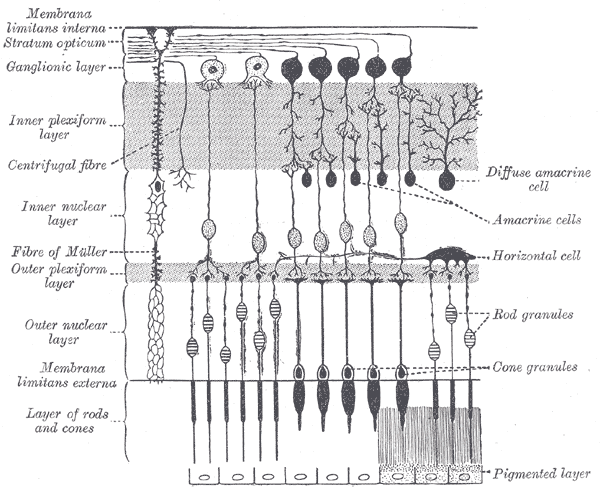 Thus, in the physiology of the cells that make up the retina, we have neighbor cells that do the same basic thing (help the body to see), but they serve qualitatively unique roles. How does this mirror the schism among Catholics and Orthodox more clearly than the lung? This is because the genius and converse weaknesses of the East and West are so often different. Many have commented that the West is strong in maintaining unity, but tragically at the expense of maintaining the beauty of the ancient faith. ‘The West’ is strong in differentiating matters of faith and morals, in that She has continued to hold councils that allow Her faithful to have clear answers to modern problems such as the technology which facilitates in vitro fertilization. But at the same time, many would say that She has suffered from a unity and clarity of message that does not have the ‘color’ of a beautiful liturgy, at least not commonly so in the United States. In that sense, the West is like a person who has defective cones but functioning rods. She can see clearly, but without color. It is as though the strength of scholastic, rational thinking is maintained, while a mystical and intuitive appreciation of the beauty of the world is lacking. At the opposite end of the spectrum, one could posit that the East in our day and age has lost nothing of Her liturgical beauty and traditional richness. Her prayer services and traditional ascetic practices are still fervently upheld, even if not well followed. However, She often comes to different conclusions about matters of faith and morals. Do non-Orthodox have a valid Eucharist? What are we to think of contraception? The fuzzy areas where clarity is needed are not so uniformly upheld. In that sense, the East without the West is like a person who is able to differentiate colors because the cones are fully functional, but the rods appear wounded, as making sense of what is happening in the ‘dark’ of this world is somewhat defective. Granted, these are overall generalizations about both East and West, but the point is that the particular genius seen in both the East and West is such that when one lacks the other, there is an illness or deficiency that will inevitably plague them. Instead of merely viewing the schism as a quantitative loss when one speaks of East and West as two lungs, if one refers to the schism as a lack of either rods or cones, one can see that something qualitative is lost when communion is lost between these two unique parts of the one Body. Each has Her strength, and each has Her corresponding weakness. May God grant us a more fervent desire for reunion through such reflections, and may our understanding of disease (and death itself) lead to a more clear understanding of the invisible and spiritual world.